With Moto Z Play bucking the trend of the middling mid-ranger, I had high hopes its 2017 successor would be even better. And, when all’s said and done, Motorola has created a fantastic smartphone in the Moto Z2 Play. Moto Z2 play is a phone that comes at an Attractive price. It provides a decent performance boost. The low-light camera quality is fantastic. But the Battery isn&apos;t as long-lasting. Very smooth phone with good display great camera good battery life supremely fast charging and a sleek metal body design got this for an old Moto exchange at 22k.Totally satisfied and recommended. Stock Android with monthly security patches. Dedicated Micro-sd slot for expansion. Super fast finger print scanner. Ability to use finger print as track pad. No manual home button except the screened one. You can not get a perfect tempered glass for it. A decent device at this price range. The performance is okayish. The phone is stylish in design and looks. I would not recommend to buy this device now as there are many new phones in the market now. Easy tap feature is good - but requires a firm shake of the hand. The device is decent in terms of usage capabilities as in my usage history lag was a problem. The device lacks RAM and battery lasts for decent amount of time. Although the design of the device is pleasing the performance is average. 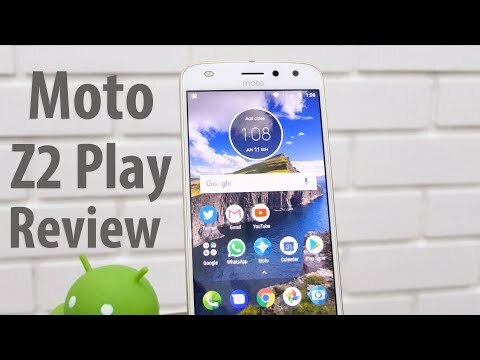 5 Pricebaba users have written their experience with Motorola Z2 Play. If you own Motorola Z2 Play, please do leave your feedback too. Lowest price of Motorola Z2 Play price in India starts at Rs. 17,999 Prices updated on 25th April 2019. Featuring dual autofocus pixel technology along with a laser autofocus, Moto Z2 Play allows you to take clear, stunning pictures. The device boasts of the classic Motorola design with Corning Gorilla Glass protection. Here are the features of Moto Z2 Play. With a 5.5-inch, super AMOLED full HD display having 1920 x 1080 pixel resolution, Moto Z2 Play enables viewing of vivid colors and sharp details while viewing videos and movies. The screen is further protected by a Corning Gorilla Glass which guards the display. The 12 MP rear camera with f1.7 aperture has laser autofocus and phase detection autofocus which clicks pictures with 25% more light. The 5 MP front camera with f2.2 aperture captures beautiful selfies with a dual CCT flash. Powered by a 2.2 GHz Octa-Core Qualcomm Snapdragon 626 processor and 3 GB or 4 GB RAM, Moto Z2 Play gives faster, better performance. The internal memory is 32 GB/64 GB which can be expanded to up to 2 TB through the microSD slot. Moto Z2 Play is fuelled by a 3,000 mAh battery which gives 30 hours of standby. The device supports turbocharging as it charges up to 50% in 30 minutes. Moto Z2 Play supports 4G, 3G, 2G, WiFi, Bluetooth, GPS, USB-C, and dual sim connectivity. Moto Z2 Play comes with Android Nougat 7.1.1, which delivers a great performance and high multitasking capabilities.